Audi is not a brand we associate with weakness. But with its performance models rare cracks have been known to appear. The R8 remains the closest anyone has come to beating the Porsche 911 at its own game in the last 50 years. That it came from a brand associated with upscale sedans and SUVs is all the more impressive. And yet when it comes to creating convincing rivals for BMW M and Mercedes-AMG out of its core range, Audi still seems to struggle. Back in Europe its A4 and A6 based RS Avant wagons have a strong following and a consistent run of form back to the original, Porsche engineered RS2 of the mid 90s. Experience of pioneering – and successfully marketing – technology like four-wheel drive and heavily turbocharged small capacity engines decades before they became industry standards should also give Audi a great foundation. And yet…The original RS5 is a typical example. It looked great, its box-arched butchness setting it apart from regular A5 coupes and offering a visual link to the iconic Ur-Quattro of 80s rallying fame. And its V8 engine was stand-out exceptional, revving to over 8,000 rpm and driving through a sophisticated powertrain of adjustable torque-split four-wheel drive and a fully active rear Sport Differential. It was all there on paper. But somehow the driving experience didn’t quite add up, the gloopy variable ratio Dynamic Steering failing in its best of both worlds promise. Meanwhile the engine sounded great and had charisma galore but the impressive sounding 450-hp V8 couldn’t quite deliver the punch to live up to the promise, given the near 4,000-lb curb weight and meager 317 lb-ft of torque. 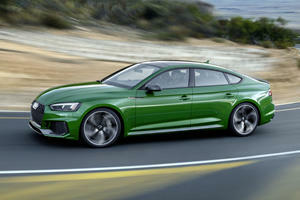 So, the task list for the new RS5 seems obvious. Keep the looks, sharpen the driving experience and fit it with an engine with torque to spare. First impressions are that’s exactly what the new RS5 does. A few character lines and a bit of side trim modernise the design but it’s fundamentally true to the previous car’s style. There’s 132 lbs less weight and promise of sharper dynamics. 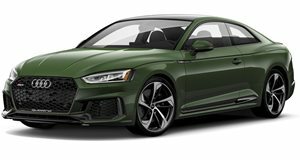 And the V8 has gone, replaced by a 444-hp, 2.9-liter, RS-specific version of the S5’s ‘inside out’ V6 turbocharged engine with slightly less capacity, two turbos rather than one and a thumping 443 lb-ft of torque from just 1,900 rpm. The 0-60 mph sprint is half a second faster than the old RS5. At a blistering 3.7 seconds, the mid-range should be transformed and you’d hope Audi Sport (as the Quattro division is now known) has been listening to criticisms and benchmarking the BMW M4 and Mercedes-AMG C63 to understand why enthusiasts love them so much. So hopes are high when you get in. Chances are your mood is already sunny because people love the way it looks and you’re never far from admiring looks and “nice car!” compliments. Sculpted sports seats in quilted Nappa leather (a $1,500 option) and a full suite of gizmos topped off with Audi’s ‘virtual cockpit’ binnacle (included in the $2,600 Navigation Package) help maintain the positive vibes. The RS5 and Quattro branding around the cabin also do well to remind you you’re in something a cut above an S5. This car’s black-tipped RS Sport Exhaust starts with a bassy bark too, this quickly settling back to a quieter tickover as the flaps in the tips shut to the default mode. Included as part of the $3,350 Dynamic Package with adaptive RS Suspension and red calipers it adds a dose more attitude to the RS5’s curb presence. And don’t worry, the car remembers your mode and if you’ve left it in Dynamic or configured Individual accordingly, it’ll fire up with the exhausts open and keep them that way. But if you’re one of those people who reckons they can get the measure of a car’s dynamic behavior in the first few hundred feet a few warning signs may be illuminating in your head as you pull away in the RS5. Road testers obsess about steering feel but this car’s passive system (the variable Dynamic system is a $1,150 option) feels vague and under-assisted. The tech spec reveals it’s a pretty lazy 15.9:1 rack, the sportier modes adding weight but no extra feel. It’s your first hint that Audi perhaps hasn’t taken the opportunity to address criticisms of the previous RS5 being somewhat remote and inert. Sadly it’s not the last. The switch from a seven-speed dual clutch to a more conventional eight-speed automatic has been covered previously but isn’t necessarily the negative some have portrayed. After all, Alfa Romeo and Jaguar are among those who’ve calibrated such transmissions to work as well via paddles as they do in automatic mode. And the RS5’s is smooth and refined, while reacting crisply to manual overrides. Just a shame the selector goes the ‘wrong’ way with + forward and – back and that the paddles are so flimsy and plasticky. Also, that often times a request for a single downshift delivers a blockshift of two or three ratios, dumping you in second or even first gear with an embarrassing flare of revs and brick wall of unexpected engine braking. Neither are cool. These are among a number of small but significant ‘tells’ demonstrating Audi Sport still doesn’t feel the need to compete with BMW or Mercedes when it comes to satisfying the more purist end of the market. 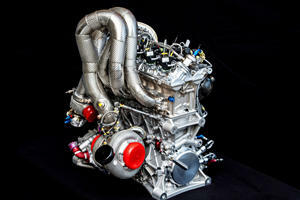 The engine is capable of delivering an impressive wallop of acceleration off the line or in cut and thrust traffic. But for all the driveline technology there’s little apparent incentive to push the RS5 hard through the corners in the way you might an M4 or C63, at least on a dry road. Snow belt drivers might beg to differ when the conditions under tire are a little more challenging and here Audi’s Quattro heritage still offers something rivals can’t. Previous experience of other S and RS models with the Sport Differential demonstrates that in these conditions it can unleash a more exciting side in Audi’s otherwise conservative dynamics, the combination of variable front to rear and rear axle torque split able at least unleashing a little rear bias. It’s no Nissan GT-R – the numb front end discourages you from leaning too hard on the chassis for starters – but in extremis there is a more exciting car lurking within the RS5’s otherwise sober demeanor. It’s just frustratingly hard to uncover. And that’s the biggest problem with this car. Drive an M4 or a C63 and from the moment you hit the starter button you’ll know exactly why you’ve paid the premium over the ‘standard’ cars in the range. Both have character and attitude you can enjoy with every mile you cover, be it on the commute or a canyon blast. Aesthetics aside there’s not enough separation between this RS5 – an $85,000 car as tested – and an S5 that costs $30,000 less. 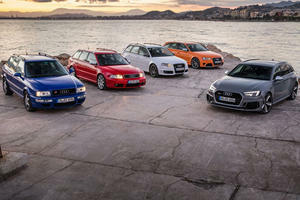 True, the RS is faster, more prestigious and stands out as something a cut above the norm when seen against regular Audis. But as a driving machine it’s almost too conservative and lacks that decisive wow factor at the wheel that would make the premium worth paying. Due to dumb trade regulations, it doesn't make sense for these cars to be sold in the US.